In an exclusive interview, Raffaele Raia -- the noted Italian soccer aficionado from Oliveto Citra, near Salerno -- said America is missing only one thing to fully grasp World Cup soccer. "Until Americans live and die with it, as we Italians do, you won't truly understand," Raia said. "That means the World Cup not as an event, or as a party, but as life and death itself, a national agony with great pain." The U.S. team needs only a tie or a win in the big World Cup game Thursday against Germany to proceed to the vaunted knockout round. American TV ratings are huge. And so are the crowds at public viewing events, with young people flocking to the beautiful game, worrying the old established sports. And perhaps best of all, unlike the Uruguayans, not one U.S. player has ever been accused of serial cannibalism. Also, the German coach and America's coach, the former German coach Jurgen Klinsmann, don't much like each other. So there shouldn't be a repeat of soccer's greatest shame: the so-called non-aggression pact of Gijon, also called "The disgrace of Gijon," when, in the 1982 World Cup in Spain, West Germany and Austria conspired to help each other get into the next round. Soccer is the beautiful game. But is also the cruelest. Americans aren't devious. Americans don't dive or grab their ankles trying to con the referee. And this worries me. "America has come very far indeed," said Raia, in his impeccable English tinged with a cultured Italian accent. 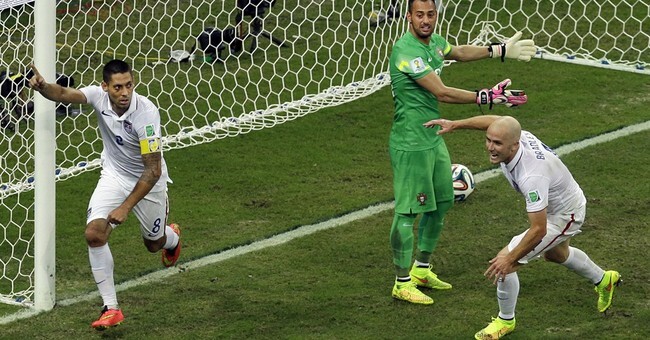 "But there is one thing missing in the American experience of soccer. Just one thing." "Pain," Raia said. "Pain to the bone." "Every kick, pain," he said. "Every ball, pain. Not physical pain, emotional pain, pain and pain, that's soccer, and madness and happiness in between. "Pain in the bones of the nation," he sighed, then picked up his razor-sharp scissors and gestured with them. "This is soccer," he said. "Joy, yes, but mostly pain." Then he said: "Do you want me to cut it like last time?" Raia has been my barber for years at George's Hair Design. About the only barbering he won't do is singe a man's ear hairs in the style of the barbers of Istanbul. And he knows soccer. When I telephoned him Tuesday during the critical Italy-Uruguay game, he was cheerful, without a trace of irony or pain. "Don't tell me who won," he said. "I'm recording it." I didn't have the heart to tell him. His Italians were painfully driven out of the World Cup on Tuesday by the Uruguayans, whose star player, the incomparable goal scorer Luis Suarez, has but one great flaw. Suarez is a noted biter of human flesh. Who says soccer can't be scary? Suarez, who plays his club soccer for Liverpool, has bitten opponents in the Netherlands, and in England, and on Tuesday he did it in Brazil, biting an innocent Italian. Suarez isn't very tall, but has very large front teeth. And when he gets frightened or angry, he's apt to sink his fangs into other teams' players. "This is the third time Luis Suarez has committed that particular crime!" said ESPN commentator Jon Champion. "He did it in Holland, where he quickly became known as 'The Cannibal.' "
For the sake of all Italy, my friend Raffaele and fans of the beautiful game everywhere, the Cannibal should be banned for a year. As they say in soccer, three bites and you're out. While we wait for justice to be served, let's consider the pain of the others. England is in pain, they're out. Italy, one of the favorites, is also out. And the defending champion, Spain, was quickly eliminated in humiliating fashion. Also out is Ivory Coast, not exactly a favorite but a talented team, which lost on a last-second penalty shot to Greece. There were many tweets referencing the Spartans at Thermopylae. I know, I was one of them. They are all feeling the agony of the feet. But perhaps nothing can compare to the pain of the Algerians in 1982, when they were one of the surprise teams of the tournament, and West Germany and Austria conspired against them. West Germany got a goal, enough to get them into the next round. And all the Austrians needed to ace out Algeria and advance was to not give up any more goals. So Germany and Austria kicked it around. They didn't try to attack. They were as cynical as a Chicago politician promising to oppose taxes. The honorable German TV play-by-play man, Eberhard Stanjek, told his audience that what he was witnessing was "a disgrace." "You cannot describe this as football (soccer)," he said. "This has nothing to do with a World Cup game." Then Stanjek, ashamed for what he was watching, stopped talking until the last 60 seconds. "There is a minute left in this, which has been described as an alleged game," he said. West Germany went on to the final game. But happily, the Germans met Italy and lost 3-1 in Santiago Bernabeu Stadium. Back then, Raia was happy. "I had just come to America," he said. "There was so much going on. I couldn't even see the games on TV. Now, of course, things are different." Now, America wants to love the beautiful game. U.S. versus Germany. Thursday. Watch it. I believe that we will win. Don't you?